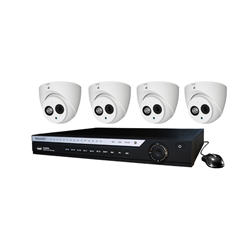 The EVI-04KIT4-21IRB from WatchNET is a highly versatile security camera recording kit which can support HD over coax cameras, analog CCTV cameras as well as IP cameras. 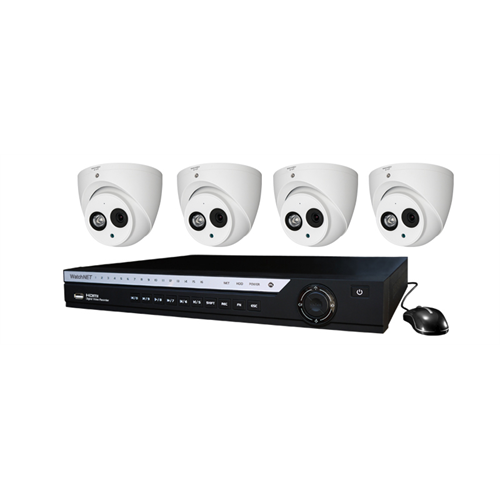 This 4 channel DVR kit comes with 4 x 1080p HD over coax night vision turret cameras. The cameras record in full colour during the day and automatically switch to night vision mode when it gets dark for viewing up to 50 meters in complete darkness. The DVR is of the Penta-Brid variety which means it’s compatible with HDCVI/XVI, TVI, AHD, CCTV analog or IP cameras, making it perfect for new installations or upgrading older camera systems. Use some of your older cameras while adding new HD over coax and/or IP cameras. Free iOs and Android apps allow for easy remote viewing without any complicated network set up. Just scan a barcode and set up login credentials. The included DVR uses H.264 compression for extended storage time on the included hard drive. A local HDMI and VGA connection is available for a local display. Not included: coax/siamese/ethernet cable for connecting cameras.